Romaco Innojet is set to showcase new Ventilus technology for drying, granulating and coating fine solid particles at interpack event in Germany. The Ventilus series was developed for use in various applications of the pharmaceutical, food and chemical industries. The company’s new Ventilus LE series, which has been developed for production scale applications, is available in three different versions, including LE-D, LE-G and LE-C.
With the new and modular Ventilus processing machines, the technology can be implemented as per the requirements. At the event, the company will present Ventilus V 100 LE-C that aggregates three processing steps, including drying, granulation and coating. Ventilus V 5 is a processing machine that can be used for drying, granulating and coating powders, crystals, granules, pellets and micro-tablets of any size from 10 µm to 2.0 mm in batches from 1,500 ml to 5,000 ml. An advanced Innojet IHD 5 hot melt device can be used for pharmaceutical applications. It helps to comply with all GMP requirements for coating and granulation with organic waxes and fats. 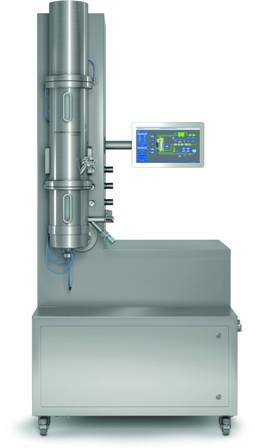 The IHD 5 includes all components such as the valve block, dosing unit and melting container, enabling it to connect the mobile device to the Ventilus V 5 for formulation process. The company produces Premium machines such as Rotojet with central bottom spray nozzle, enabling to exchange and clean without interrupting operation. Romaco Innojet also offers integrated solutions for wet granulation with an upstream high-shear mixer, in addition to systems for wet and dry milling. Through an enclosed material transfer system, all components are connected to the Ventilus LE-D fluidised bed dryer. In addition, of Romaco Kilian’s the upgraded STYL’ONE Evolution single-stroke press will be exhibited at the event. With configurations for mono-layer, multilayer or core tablets, the redesigned STYL’ONE Evolution can achieve a maximum output of 1,750 tablets per hour. Image: Romaco Innojet Ventilus V 5. Photo: courtesy of Romaco Group.